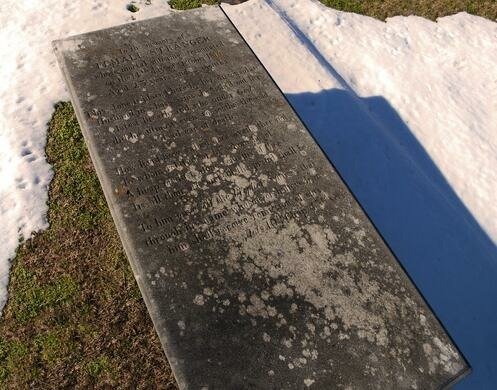 This grave marks the passing of a historic Jane Doe whose identity remains a mystery to this dayAccording to local legend, a young couple arrived in Alexandria, Virginia by ship in 1816 and rented a room in Gadsby's Tavern at 138 North Royal St. The woman was gravely ill, and her husband hired a local doctor to help care for her—on the condition that he ask no questions about his or his wife's identities. The woman's condition quickly deteriorated, and she eventually died on October 14, 1816. Her husband borrowed money from a local businessman to bury her in town, repaying him with a note from the Bank of England which later turned out to be a forgery. The couple had secluded themselves from the goings-on in Alexandria, and their presence at the tavern became subject to rumors and speculation. The woman's grave can still be found in the St. Paul's Episcopal Church section of the town's cemetery. 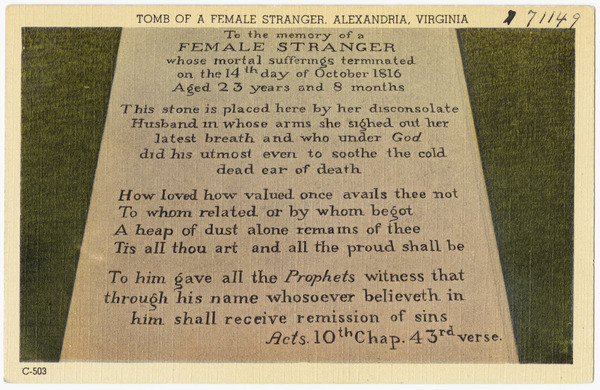 A slab on six pillars and surrounded by a stone curb bears the inscription, "To the memory of a Female Stranger whose mortal sufferings terminated on the 14th day of October 1816 Aged 23 years and 8 months. This stone was placed here by her disconsolate Husband in whose arms she sighed out her latest breath and who under God did his utmost even to soothe the cold dead ear of death." There are many theories as to the woman's identity, most notably that she was Theodosia Burr Alston, the daughter of former Vice President Aaron Burr, who was mysteriously lost at sea in 1813. Another theory suggests that the Stranger was Napoleon Bonaparte smuggled out of exile in drag. Either way, the grave (and the above story) briefly came to national attention in the mid-19th century when several articles recounting the story were published in newspapers across the country. The grave continues to be a minor tourist attraction in Old Town Alexandria.